Canonical and Lime Micro showcased SoDeRa software defined radio (SDR) a couple of months ago, with a promise to launch a crowdfunding campaign later this year. 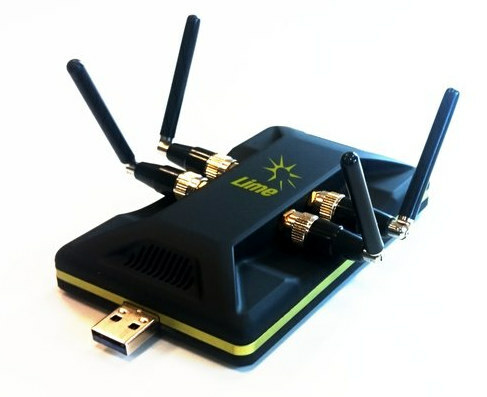 They’ve fulfill their promise, and launched the open source SDR, renamed to LimeSDR, on Crowdsupply. Wi-Fi, GSM, UMTS, LTE, LoRa, Bluetooth, Zigbee, RFID, Digital Broadcasting, configurable through apps. The board interfaces with systems running Snappy Ubuntu Core, and you can enable wireless protocols the easy way by simply installing the required app with snappy. If you implement a new protocol, it can also be easily shared through snappy apps. Potential applications include radio astronomy,RADAR, 2G to 4G cellular basestation, media streaming (DVB, ATSC, ISDB-T), IoT gateway, HAM radio, wireless keyboard and mice emulation and detection, tyre pressure monitoring systems, aviation transponders, utility meters, drone command and control, test and measurement, and more. It’s not the first FPGA based SDR system that’s available to hobbyist, so the company compared it to other platform such as HackRF One, BladeRF, and others, include ultra-low cost solution based on RTL-SDR. 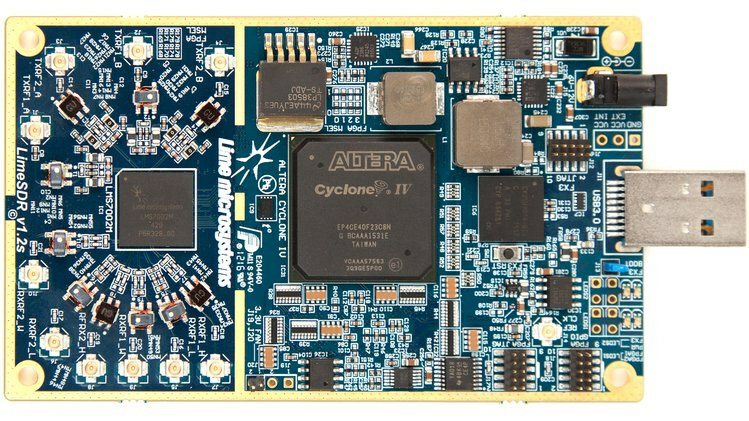 As mentioned in the comparison table, LimeSDR is open source hardware and you’ll find the Altium schematics & PCB layout, as well as the manufacturing files in LimeSDR-USB github repo, Altera Quartus FPGA project, Cypress FX3 firmware, source code for the drivers and GUI, and more in the various repo available on myriadrf github account. So far, the project has raised close to $70,000 out of its $500,000 goal. A $199 early bird pledge should get you LimeSDR board, as long as you are part of the 500 backers (200 left), after which you’d need to pledge $299 for the board. Unless you provide your own antennas, you may want to add $85 to your pledge to get the four antennas and cables, or if you want a complete system with the board, antennas, enclosure, and “turnkey support”, go for the acrylic or aluminum kits for respectively $499 and $599. Shipping is free to the US, and between $15 to $35 to the rest of the world, with delivery scheduled for November or December 2016 depending on the pledge. This is really great value. But this market has been tested before … not sure they will succeed. SDR just seems to be too much of a specialized field. Some more info about LimeSDR and Canonical involvement if you follow this link. I think the idea here is that anybody could use this, even without SDR / RF experience, as you’d just need to install an app to implement the wireless protocol you need. For example, it could be used as a DVB-T2, ASTC, ISDB-T “TV” station to test different tuners standard within an office. If it’s indeed easy to use then it could be a flexible alternative to other tools. Good luck. Just the FPGA and rf ic are worth more than $100. The $199 early bird is kind of misleading. Post Kickstarter you are really talking closer to $400 for a good out of box experience, and looking at what the BOM & build costs probably are, the price is too high. Someday someone will get this Open-SDR thing right, and a robust community will emerge. But I don’t think today is that day. We won’t get into the fact that they’re all gone- you’re spending $299 for the base experience, more to $400 for the good out of box. Biggest problem with SDR (you can get cheap receive for most bands ($10~) with the little DVB-T dongle that is little more than basic SDR in the first place…) is that the credible modes for receive and/or Transmit/Receive aren’t cheap. When you get into the 30+ MSPS domain, you’re talking expensive as hell hardware (which is why the stuff in the 30+ range (most of this…) is $300-600 on the cheap and more like $1500. They’ve added more early bird rewards at $249. 95% funded with 21 hours to go.. Will they make it? Yep. 122% funded. Somehow about 500 backers came out on the last day. New related crowdfunding campaign for LimeNET boxes with a more powerful Intel Core i7 processor. There are three main LimeNET hardware stacks: Mini, Enterprise, and Base Station.